I have another exciting vinyl nail decal to show you. It’s part of that Christmas glitter pack I got from Vinylsaurus Rex. This is one of the two Christmas styled trees she offers in this pack. The one thing I love about her nail decals is how easy they are to use! 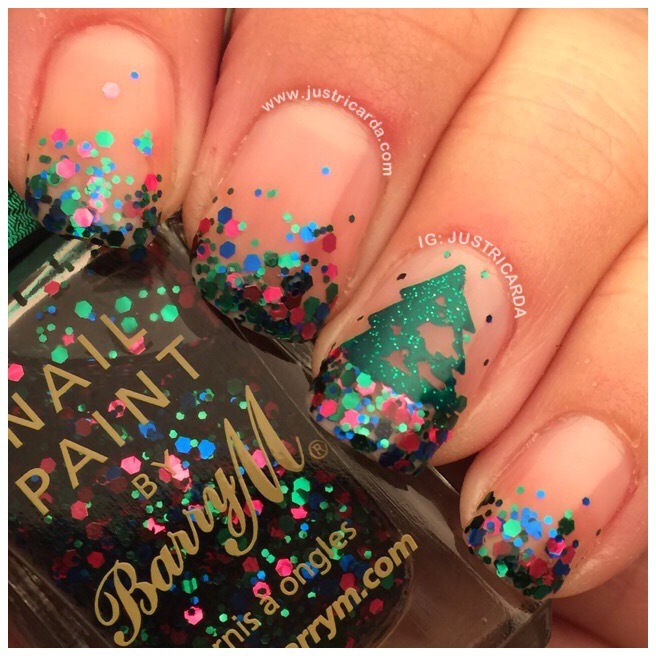 Barry M.’s Superdrug Xmas LE 2012-B. I think this was part of a holiday special they had at a specific store over there in England from two years ago. I got this polish from an awesome British nail mail buddy. I do adore how my nails look tonight. It’s so simple and festive at the same time! You can never go wrong with glitter tip gradients. Love it! Thanks for being a sponser for this awesome giveaway also!